Even tender foods like fish and seafood can benefit from a good marinade (see marinades). Marinades keep fish and seafood from drying out and the oil in the marinade helps keep them from sticking. One very important rule about marinating fish and seafood. A highly acidic marinade, one containing lots of vinegar or citrus juices can actually cook the fish or seafood so you need to use mild marinades for short periods of time. This is important. Keep the acid and the times low. If you are not going to marinade for long, why bother? One, because it doesn't take long so it can be done in as little as 30 minutes, which is the time you need to get the grill ready and plan out the rest of the meal. And two because you can add loads of flavor to everything you marinade quickly and easily. This is a quick and easy way to add all the seasonings and flavors that you want with any fish. When it comes to fish, there are two types, firm and flaky. 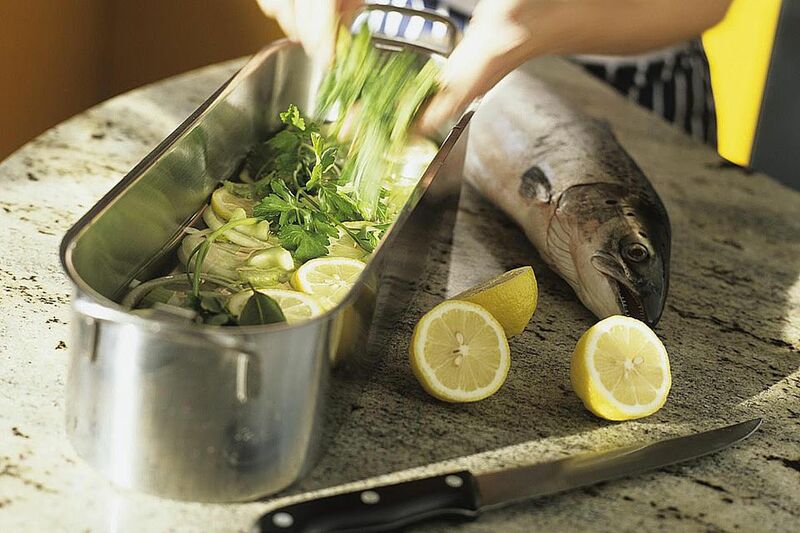 A firm fish (think big fish) can take a stronger marinade for longer. Examples of firm fish are Halibut, Tuna, Marlin, or Sturgeon. Flaky fish, you know, the kind that tries to fall apart on the grill, can't take a strong marinade and shouldn't be marinated for long. Examples of flaky fish (think small fish) are salmon, trout, and cod. Marinate in a large, resealable plastic bag. Squeeze out as much air as possible before sealing. Turn occasionally to keep the marinade evenly distributed. Marinate in the refrigerator.